It's easy to forget that Gary Sheffield hit 509 home runs and 1,676 RBI in his 21-year MLB career. Unfortunately, his name was tied to alleged PED use that has tainted his legacy. 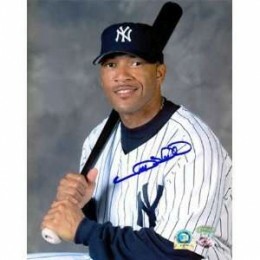 However, there are still plenty of collectors, who pursue Gary Sheffield cards and autographed memorabilia. 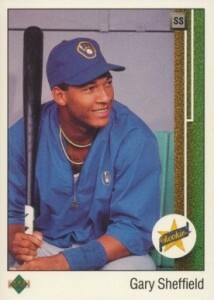 Gary Sheffield has a total of seven rookie cards, all coming from 1989 baseball sets. His 1987 ProCards minor league card is also popular with collectors. Sheffield's first certified autograph card is in the 1993 Classic Best Gold set. It is a minor league card that is hand-numbered to 2,050. His first major league autograph cards were produced by Donruss and Upper Deck in 1997. 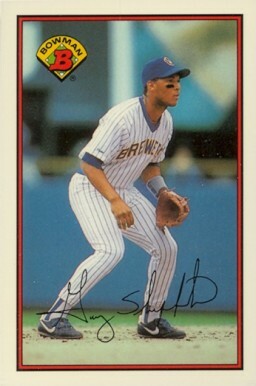 Upper Deck produced the first Gary Sheffield memorabilia cards in 1998. These include both jersey and bat cards. One of the more unique cards is an over-sized box topper card from 1998 SP Authentic Baseball. Numbered to 125, it measure 5" by 7" and has a large jersey swatch. Prices Gary Sheffield's autographed memorabilia dipped as a result of his alleged connections to PEDs. He rarely participates in organized signing events. 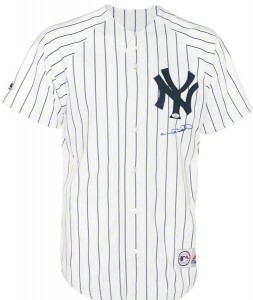 However, he was a willing in-person signer during his career so there is a significant amount of memorabilia available on the secondary market. 1989 marked the return of the Bowman brand and its focus on rookies. Slightly over-sized, the card is very cheap. More pricey is the premium Topps Tiffany version that was available only in special factory sets. Tagged with the iconic "Rated Rookie" moniker, this card features a great action photo that helps make it very popular with collectors. Like virtually all Gary Sheffield rookie cards, prices are kept in check due to extremely large print runs. 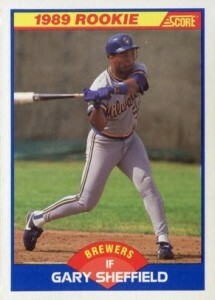 This is definitely one of the more plain Gary Sheffield rookie cards. There is a Glossy version that was exclusive to a factory set. It carries a premium, but it's still very affordable. A very popular rookie card of Sheffield, it was one of three total cards Score printed of Sheffield that year. However, this is considered to be his only Score rookie card. 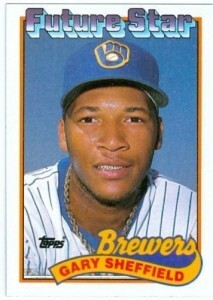 There's definitely no mistaking the Sportflics Gary Sheffield rookie. It comes with the company's trademark lenticular design that flicks between a portrait and a shot of Sheffield batting. 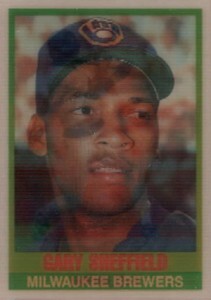 The slugger appears on a second card in the set that also features Gregg Jefferies and Sandy Alomar. 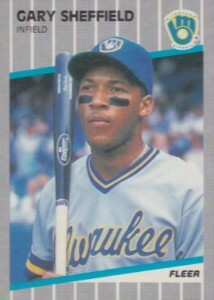 It might not be worth much, but this is one of the more iconic Gary Sheffield rookie cards. In addition to this card, Sheffield has a rarer Tiffany version. Like his Bowman Tiffany card, it has a glossy finish and brighter card stock. Additionally, Sheffield is one of 22 players included in the 1989 Topps Glossy Rookies set that was inserted in jumbo cello packs. This card was originally printed in error with the moniker SS on the front printed upside down. It was later corrected, although neither version carries a significant premium. 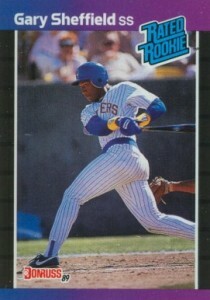 While it falls far behind the iconic Ken Griffey Jr, Sheffield is still considered one of the key rookie cards in the set. 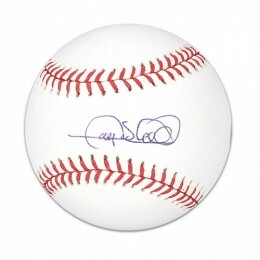 Below you will find an example of what Gary Sheffield's authentic signature looks like. This can be used as a first point of reference for determining the legitimacy of autograph memorabilia, but is not a substitute for having your items authenticated by a well-respected professional autograph authentication company. Some of the trusted sources within the sports memorabilia market include the following companies: PSA, JSA, Steiner, Mounted Memories and Tristar. Click on any of the images below to view full size photos. This is a unique signature with few, if any, discernible letters. A distinguishable character at the start of the signature starts below the horizontal plane. It forms a half-circle before a horizontal line extends back through the left. The end of the line has a small curl. The very tiny written letters "a-r-y" are visible when written with an ink pen. When written with a Sharpie, those letters are hard to discern. The "S" of the last name is visible. A series of two large loops and two much smaller ones are visible.